Tomoko Yamamoto, being a photographer, a composer, and a soprano, has long been interested in presenting multimedia programs of music and photography. It was in 1993 when she set out to photograph the sites associated with Johann Sebastian Bach in Germany. Between 1994 and 2006 she has photographed the places associated with Franz Schubert's 1825 travel in Austria, which constitutes her "Schubert Project." In 2000, her photographs of Bach-related places were used as a continuous slide show during multiple performances in Baltimore Bach Fest 2000 at Second Presbyterian Church in Baltimore, Maryland. It was particularly effective when the showing of an organ in St. Blasius Church on the screen matched an organ performance during the Fest. In 2003 she put her photographs and her own singing together in a program titled, "Bach and his World." See the list of her past performances. She has traveled to a few sites in Japan to photograph for her own songs based on ancient Japanese texts. She continues to experiment with the format combining her singing performance and her travel and landscape photography. She has even used her impressionist reflection photographs to illustrate the feelings of spring and summer. She believes that the visual elements would enhance the music being performed by helping the understanding of the composer's background and/or of the text being sung. In 2009, she moved to Vienna, Austria, and started the process of creating a few multimedia programs of Lieder and photographs. She established herself as Tomoko Yamamoto e.U. and now she organized concerts of Foto-Liederabende Wien. 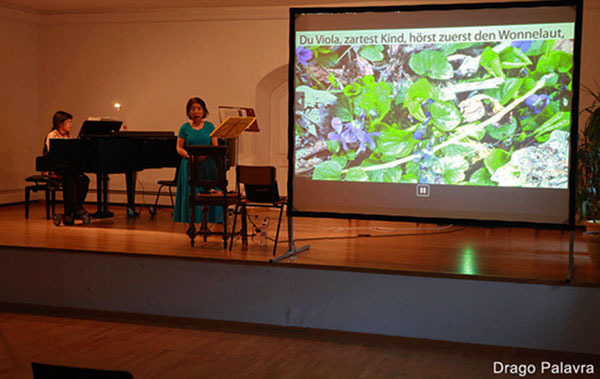 Along with Rudolf Gindlhumer, she organized the first two concerts of Multimedia-Flöte-Liederabend in November,2013. This is a unique combination of songs and instrumental music of flute and is titled "Blumen in Wien". In November, 2014 she decided to take a look at "Winterreise," the most well-known song cycle of all rather than organizing another Foto-Liederabend on the theme of water. "Winterreise" is a song cycle composed by Franz Schubert on the text of Wilhelm Müller. Adding photos to "Winterreise" is not that unique, but looking for photographable landscapes for the song cycle has led her to travel to Dessau, Germany, Wilhelm Müller's birthplace, and Brussels, Belgium where Müller had a love affair. Now she has found a new way to interprete "Winterreise," taking the love affair Wilhelm Müller had in Brussels seriously. In order to introduce her new interpretation to the public, she started a blog called Winterreise with Photos. © 1997-2015 Tomoko Yamamoto, all rights reserved.